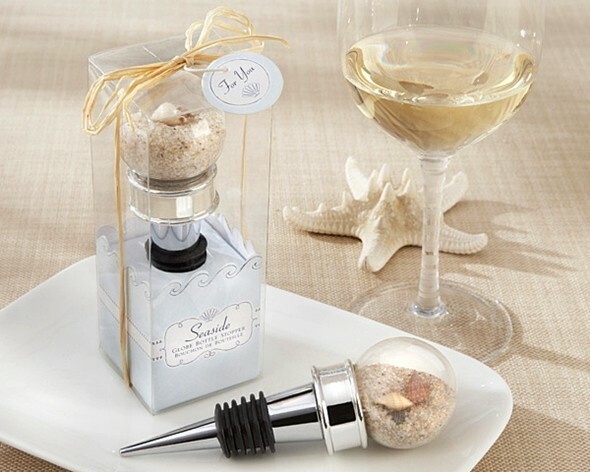 A very creative and unique bottle stopper makes it possible to take a piece of the majestic beach wedding home with everyone. A small globe held atop the bottle stopper is filled with smooth sand and small sea-shells. Have your guests bring the tranquility of the beach home. Each stopper comes packaged in a display gift-box featuring stylized, cutout waves on a sea-blue base with the words "Seaside" Globe Bottle Stopper, a natural raffia tie and a coordinating seashell-motif "For You" hanging tag. Personalized tags for your favors are available separately as Product Code: AK-31001NA-03-W.
"My favors order arrived in perfect condition, and I am very happy with the candle holder wedding favor ideas in particular. 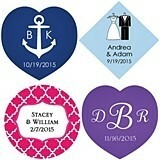 Your selection of affordable wedding favor ideas is really wonderful again this year." Kathy D.